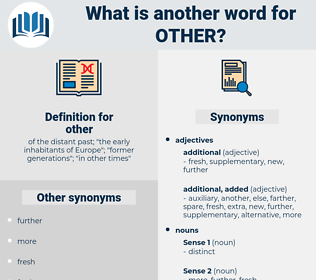 What is another word for other? 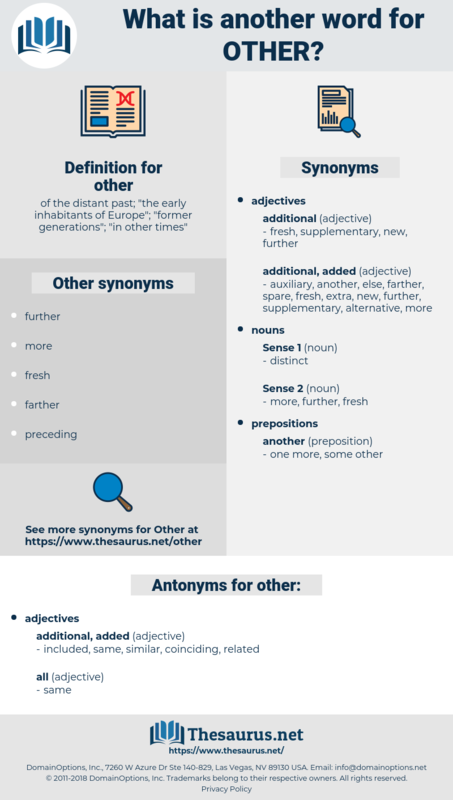 of the distant past; " the early inhabitants of Europe"; " former generations"; " in other times"
others, another, subsequent, previous, fellow, respective, similar, non-financial, non-competition, later, Andere, same, Inne, second-, non-training, miscellaneous. others, another, factors, Organizations, Resources, departments, institutions, organisations, violations, substances, therapies, ministries, organisms, nations, Programs, Children, expenses, Bodies, women, data, GS, otherwise, miscellaneous. included, same, similar, coinciding, related. homological, aforementioned, prospective, ongoing, homogeneous, future, tantamount, contemporary, equivalent, present-day, equal, analogous, indistinguishable, very, like, aforesaid, coming, akin, present, said, selfsame, parallel, unborn, homologous, current, less, extant, alike, identical, homogenous, kindred, uniform, fewer, comparable, kin. He did not believe it too much to say he had done more for it than any other man. Has no other a right to you?